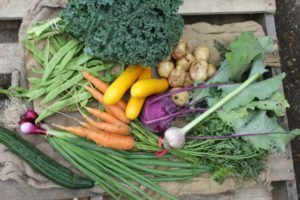 A CSA Harvest Box program offered in partnership with Close to Home Organics and Snowy Mountain Organics! We currently have re-opened sign up options to previous members. Membership for 2019 is now open! To sign up, you must first read our terms and conditions. At the bottom of the terms you will find the sign up link. Click here. What dates do the various options run? Fruit Share Extended Season option (9 deliveries) is from 3 October to 28 November. 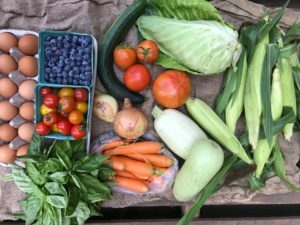 What does a CSA subscription cost? Egg share (1 dozen) options are $8/week. A $10 annual membership fee is charged at sign-up to cover the costs of CSA management and payment processing. *Last year we decided that farmers are better at what they do when they work together. After all, agriculture’s roots are based in communities of folks helping each other out and trading with one another to diversify their product bases. We all want increased benefits for our members and a stronger foundation from which to do that- by cooperating with one another we have that advantage. 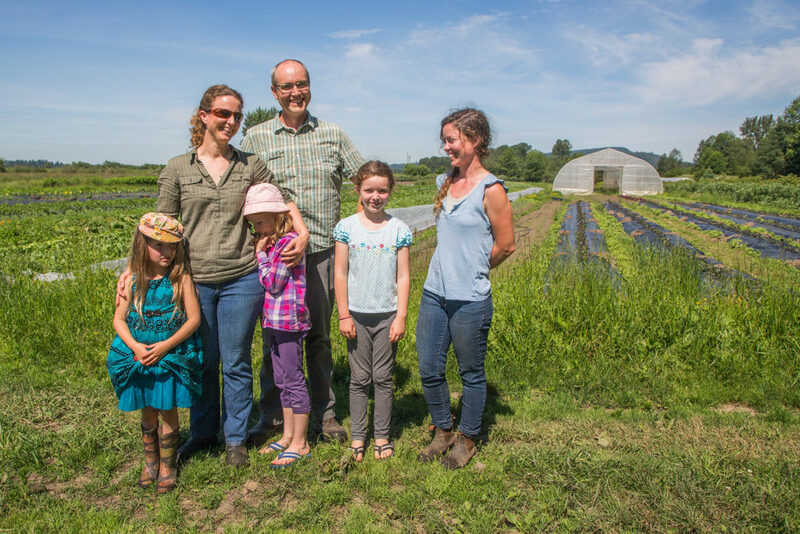 Thus Earth Apple Organic Farm, Close to Home Organics and Snowy Mountain Organics are forging ties and working with a model that we believe will benefit everyone. Please join us this season in this circle of delicious potential! You’d like to be a CSA member, but prefer to choose your own produce/ schedule too hectic to commit every week/ have special dietary needs/ you’re away for many of the weeks of the season? !… Or perhaps you want to do a Glen Valley box and have the option of adding to it with what we offer at the farmers market… this is the CSA membership for you! Choose from a $250- $550 membership with the option to add more as the season progresses. Sign-up before and pay before May 1st and you’re entitled to a 5% discount! Pick-up your share anytime between May and December at the summer market at Trout Lake or the Winter Market at Nat Bailey Stadium. More credit can be added to your card at any time. We can keep your card safe in our cash box= no risk of lost or stolen cards and you will never need to worry about forgetting your card or not having cash on hand! Earth Apple Market Share SIGN-UP: CLICK HERE. Community Shared Agriculture (CSA) is a type of farm program that recognizes the importance of the relationship between producer and consumer and is based on the understanding that operating a small-scale sustainable farm is a community-oriented endeavour. Both farmer and consumer share responsibility in both the benefits (fresh, local, healthy and ethically grown produce) and risks (bad weather, illness, pests) that are inherently involved in the practice of organic farming. The consumer gives the farmer one easy payment in the spring when the biggest expenses (leases, seed, fertilizer, equipment maintenance/repair, rentals, tilling, etc) are incurred by the farmer and the CSA member benefits from a weekly supply of the freshest and tastiest produce throughout the growing season. We’ve heard over and over again from CSA members that they love this program, because it encourages a well-rounded diet full of vegetables, encourages them to be creative and often leads to more socializing with friends so they can share the bounty and show off their new culinary skills! Please note that the CSA is not a bulk buyers club, however get on our list to hear updates about bulk buying opportunities (tomatoes, blueberries, pickling cucumbers, potatoes). This year we have decided that farmers are better at what they do when they work together. After all, agriculture’s roots are based in communities of folks helping each other out and trading with one another to diversify their product bases. We all want increased benefits for our members and a stronger foundation from which to do that- by cooperating with one another we have that advantage. 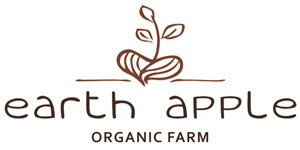 Thus Earth Apple Organic Farm, Close to Home Organics and Snowy Mountain Organics are forging ties and working with a model that we believe will benefit everyone. Please join us in this circle of delicious potential! *Please note that some vegetables are in season for a long periods of time, such as summer squash, kale & beans. Thus you will see them in you box multiple times (or throughout the season as is the case with kale). Be ready to find creative and delicious ways to keep your recipes and meal ideas fresh and fun! 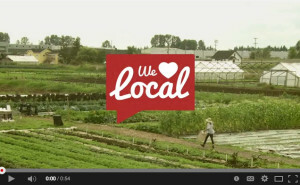 Watch this video of Farmer Shirlene from the early days discussing our CSA program.